Don't listen to the other review's this is a good movie for families! I thought I was taking my family to a G rated family movie about a dog. Leave it to the Hollywood elitist to show a homosexual couple with a picture next to the bed of the 2 guys hugging each other. Leave your sick perversions out of movies or we will stop coming. Almost beyond belief. Kinda glad this movie bombed at the box office. They used stuffed animals for the mt. lion and wolves. A little kid wouldn't notice. Otherwise a great movie. Oh such a good movie, I couldn't wait to see it and toward end my friend and I needed a Kleenex, a great story! I didn't see any gays people are talking about and I'm a Christian and against gays period! 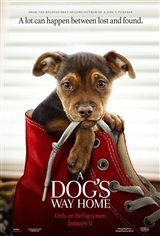 Truly enjoyable for all ages.. Worth seeing this great Movie..
to those who did not see the movie A DOGS WAY HOME just a warning you will cry from beginning to END. If I could change the rotten tomatoes of that movie it would be 100%.